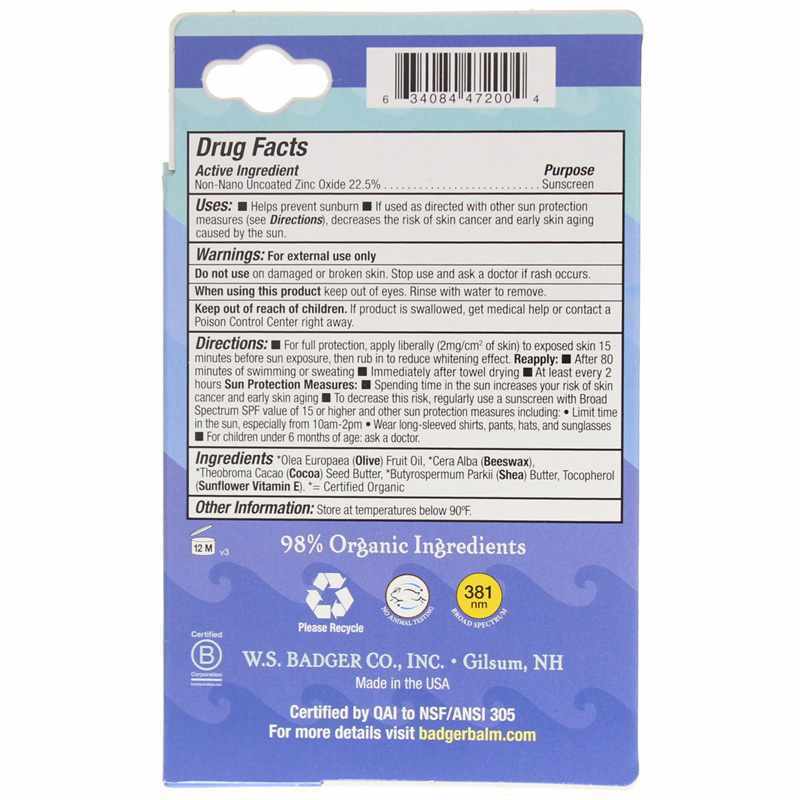 All Season Face Stick Sunscreen SPF 35 from Badger is a convenient, all-natural and organic sunscreen that provides broad-spectrum sun protection for the face during outdoor activities. Ships today if you order in the next 13 hours 23 minutes. Whether you're surfing the waves or skiing the slopes, be sure you're taking sun protection as seriously as you take your sport. Give the delicate skin on your face ample, all-natural protection with Badger's All Season Face Stick. Unlike the rest of the body, which is usually covered by clothing, the face is exposed to the sun's rays every day. And its delicate skin is more susceptible to damage, including sunburn, uneven skin tone and wrinkles. 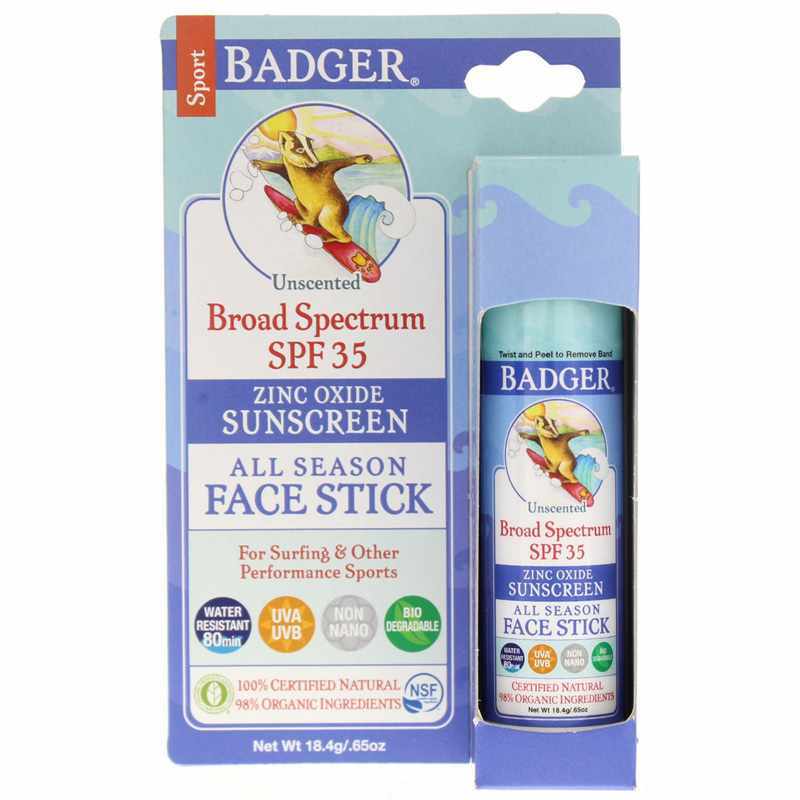 Specially designed for people on the go, the All Season Face Stick makes it easy to give your face the great, natural protection of Badger's sunscreens anytime, anywhere. Perfect for athletes and other people ho spend time outdoors, All Season Face Stick provides sport-level protection that's water resistant for 80 minutes. It's also great for protecting skin from windburn and chapping. Protect your face no matter wind, shine or rain. Order All Season Face Stick Sunscreen SPF 35 today. *Olea Europaea (Organic Extra Virgin Olive) Oil, *Cera Alba (Organic Beeswax), *Theobroma Cacao (Organic Cocoa) Butter, *Butyrospermum Parkii (Organic Shea) Butter, and Tocopherol (Sunflower Vitamin E). Non-Nano. Cruelty-Free. NO Animal Testing. NSF Certified. Made in USA. Biodegradable. Reef-Safe. For full protection, apply liberally (2mg/cm of skin) to all exposed skin 15 minutes before sun exposure, then rub in to reduce whitening effect.